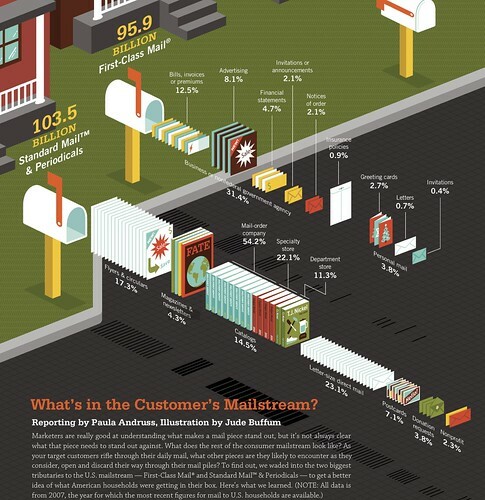 From this great illustration of the average US Postal Service residential customer’s mailbox we can glean some interesting facts. Amongst them is numerical evidence as to why I don’t check my mail very often. There are almost 200 billion pieces of mail delivered to the (and Wolfram Alpha couldn’t deal with any of this) 111 million USA households each year. That’s an average of almost 1,800 each, or 5.7 items a day* or 34 a week (with 6 day delivery). I recall it was around 24 in 1999, so times have been strangely kind to the USPS. Here’s the problem – 5.3 of those 5.7 letters each day are “unwanted”, and the only 0.5 are not. I’m including bills in the unwanted, as nobody really likes getting them. Moreover in the USA in particular, bills are used as just another way to deliver you junk mail. Meanwhile the average household is getting about 1 personal letter a month, and 1 card or invite a week – though many of those cards will also be junk. It’s really hard to define the size of the junk market in the USA, or anywhere, as companies for some reason get really defensive about their mail being classified as ‘junk’ or ‘unsolicited’. 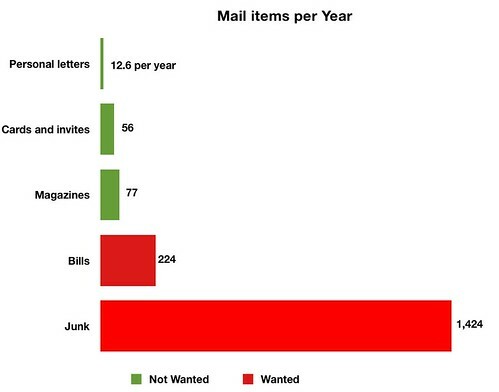 Also in the USA the junk mailers get around ‘no junk’ signs by personally addressing much all of their materials – those are the catalogs, direct letters and so forth in the graphic above. Moreover it is often difficult to distinguish junk (‘get a pre-approved credit card’) from bills (‘Here’s your credit card bill – with a pre approved offer!’) – and sometimes that is deliberate, so you will open the junk. Sadly, no matter what you call it, it is all just so much wasted paper (the occasional beautifully crafted wedding invitation aside.) What is particularly strange are the 15 Billion catalogs sent out each year. That’s a whole lot of paper in the internet age. We all belong to the internet age – paying bills online (usually automatically), sending and reading thousands of emails, twitters, blog posts and so forth each year and reading our news online. We only use snail mail (the name says it all) when we deliberately want a slower and more classy process, such as for those elegant wedding invites. I last sent a personal letter when I was in Pakistan. In 1998. Or was it Europe in 1996? Either way – it’s long past the time when the mail was something I cared about. Yet we still have the Pavlovian instinct, much like when a phone rings, of checking the mail when it arrives. I often do as well, but what could be in my mail box of any importance? So why do we as a society insist on a service to deliver our mail every day? Can’t we reduce it to once every 2 or 3 days, or even once a week? Businesses can perhaps have more frequent deliveries, but they can pay for it, and besides – this will prod them into going fully online. How about we offer a dual service – one service that will get me The Economist yeserday (e.g. by print on demand and hand delivery) instead of Monday/Tuesday and that will deliver the Independent to me before I wake up on Thursday and another service that delivers letters once a week? We can take the savings, and use them to contribute somehow to the roll out and maintenance of decent broadband infrastucture. We could even give the ownership of that broadband infrastructure to the NZ Post, just like it used to be.